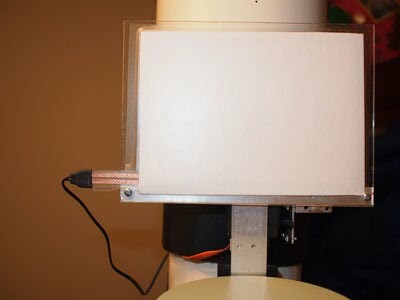 There is also a standalone program for controlling Nebulosity to determine flat exposure time based on ADU saturation desired, and capture specified number of flat frames. My latest addition... I dug out my old Pololu maestro 6 channel servo controller and rebuilt this. The Maestro is nice because its small and is designed specifically for servo control. I also wanted the ability to use the ASCOM driver to control the brightness via sequencing software so added a second servo that turns the EL panel power supply potentiometer. Using push buttons the device can also be operated without any computer connection. Aluminum strip 1" x 1/8" , 1" x 1/16", 1/2" x 1/8"
Aluminum angle 1" x 1"
The entire assembly is mounted to aluminum strip 1" x 6" x 1/8" . That is mounted to the dovetail rail using a flat head screw. 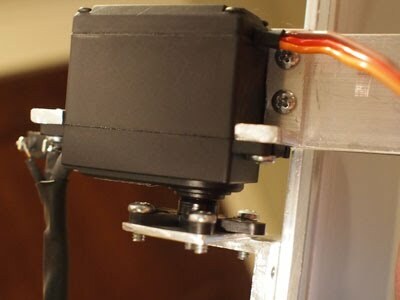 The servo is mounted to the main rail via 2 L shaped brackets. These are made from cutting 1/4" wide piece of 1"x1" x1/8" aluminum angle. Holes were drilled and tapped for 4-40 screws (all screws below are 4-40). 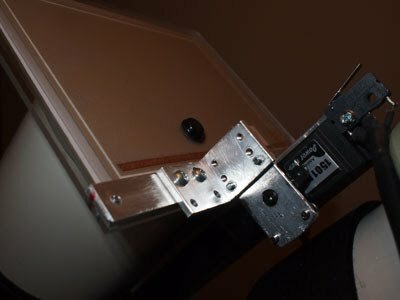 a small micro switch is mounted to the forward servo mount (see directly below). A 4 prong servo "horn" (comes w/ servo) was attached. For greater rigidity a small plate was cut from 1" x 1/16" aluminum and attached w/ 4 screws. 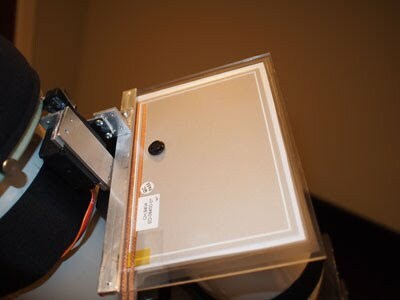 The plexiglas plate was attached to the aluminum rail using 1/2" x 1/8" strip. 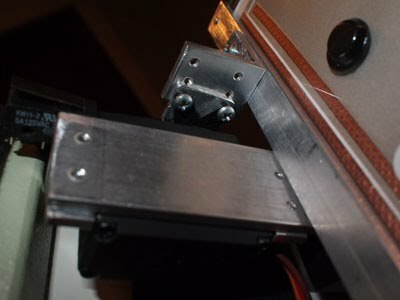 The servo is attached to the EL panel rail using an L-bracket cut from 1" x 1" angle (see directly below, the extra holes were from previous failed designs). The EL panel is fixed to the plexiglas plate using clear contact paper. An ASCOM driver uses the latest switch interface to control. (ASCOM Ver 6.1 is required) SetSwitch(true) = on/closed, SetSwitch(false) = off/open. GetSwitch() returns the position (true/false). A second servo attached to the brightness potentiometer can control the lever. Connected via a piece of Teflon rod with a 1/4" hole and set screw for the potentiometer shaft. This is screwed to a standard servo hub using small wood (#4) screws. (Another option would be using strong double-sided mounting tape to the stock knob). ASCOM methods SetSwitchValue(0-180) correspond to the servo angle and GetSwitchValue() will return the servo angle. Close-up, rail, back of Servo L bracket, Servo plate and servo horn. Close up of Servo/Potentiometer connection, machined from Teflon rod. 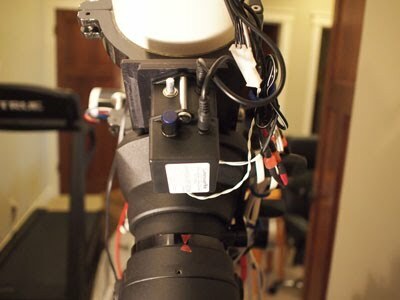 This will control Nebulosity to automatically find the desired flat exposure time based on the %ADU saturation. Also runs a script to capture the desired number of flat frames with specified binning. To Install: Unzip and double click setup. It will run upon installation, just hit abort when prompted 'Nebulosity not Found'. (You'll find the program listed in the startup menu under scopefocus - AutoFlat) The latest version 1.0.0.8 should work with Nebulosity versions 2 and 3. 2) Select the path where Nebulosity.exe is located. 4) Set the desired starting point. The closer you are the less time it takes to find. 7) Select the number of flats you want it to save. 8) If any binning, select that as well. 10) Just hit go, it will determine the necessary exposure time and save the desired number of flats named "AutoFlat" to the selected directory. All entered values are stored as settings (except Total Number) . The autofocus software will control the flat panel and automatically adjust exposure time to the goal ADU. --now Neb ver 2 compatible.